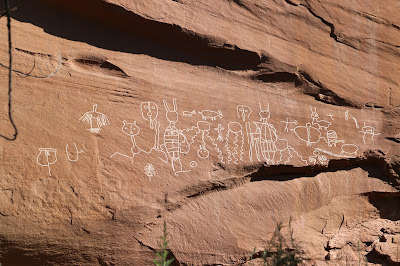 The Upper Sand Island Petroglyph Site is located near Bluff, Utah. The site is accessed from the opposite end of the Sand Island Campground than the more well known Sand Island Petroglyph Site. The upper site is stretched out over a greater distance. Petroglyphs at the site include Archaic, Ancestral Puebloan, Navajo, Ute and even what might be a couple of wooly mammoths and a bison from the Clovis period. Being able to compare the wide-ranging styles of images at one location is quite remarkable not to mention unusual. 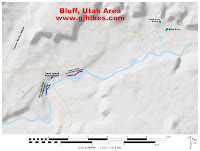 About 4 miles west of the town of Bluff is a large sign marking the turnoff for the Sand Island Boat Launch and Campground. Drive down the road and take the dirt road to the left towards Loop A of the campground. Parking is available just past the Ranger Station near the restroom. There is no charge just to visit the site unless you plan on camping or inadvertently park at one of the campsites. From the parking area follow the road on into Loop A for several hundred feet. The trail is to the right of the campsite at the end of the road. From there follow the trail east along the cliffs and after another 100 feet or so you will come to the trail kiosk in this photo. There is a wealth of information on the kiosk that is well worth studying before continuing that will greatly enhance your visit. 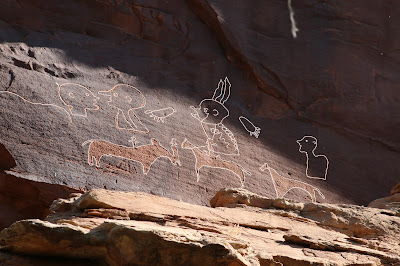 Not far from the trailhead there is a small panel of Ute petroglyphs that are clearly visible from the trail. 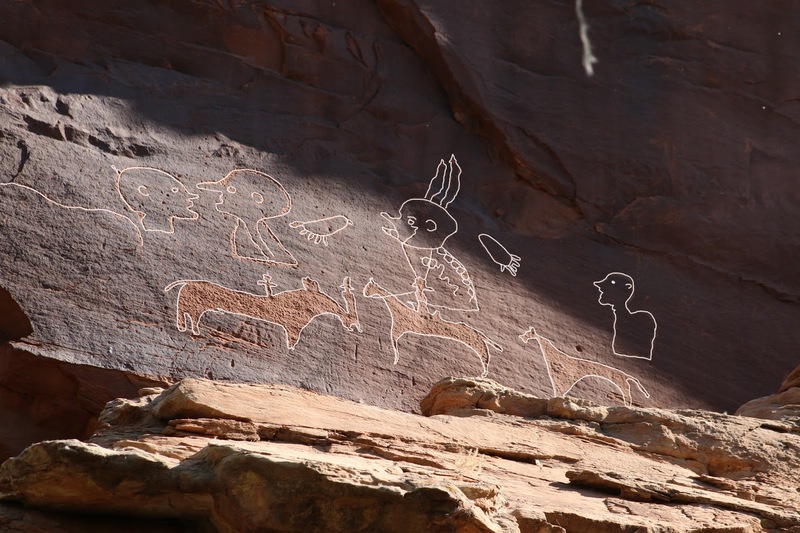 One of the next panels encountered has a lot of images including a group of 5 phallically fixated Kokopelli figures that look like they are putting on quite a floor show. This photo is of what is believed to be a Columbian mammoth and a bison dating back 13,000 - 11,000 years. The peck marks have been examined and show patination that would support that time frame. 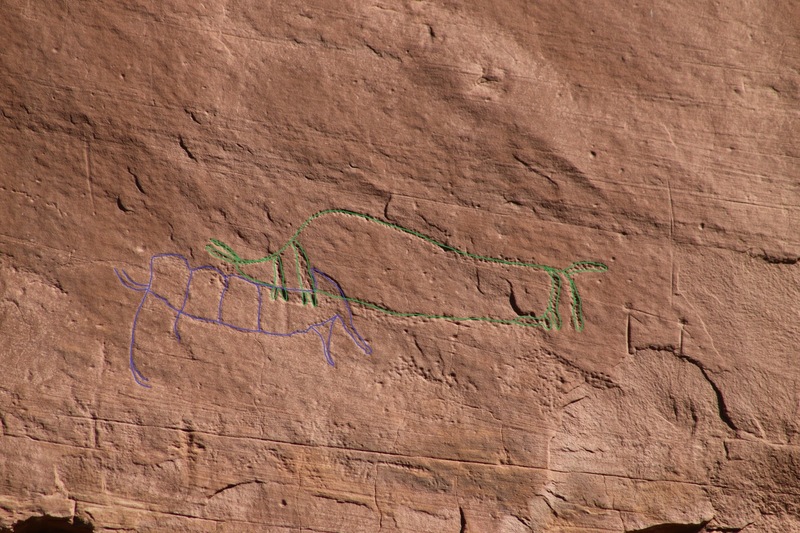 We outlined them on the computer to better distinguish the mammoth, on the left in blue, and the bison, on the right in green. 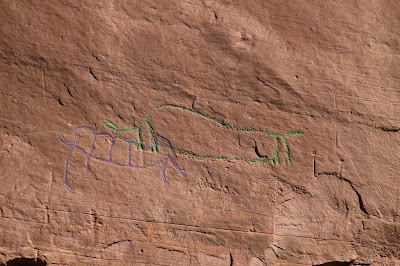 There is another image of a mammoth ~5 feet to the left of the one in this picture. This panel has a lot of interesting images. We highlighted them on the computer so they would show up better. They actually look better in real life without that being done. If you click on this picture and view the hi-res version you can see all the details better. This panel of Navajo images also looks better without being traced but we outlined the images anyway to make those in the shadows standout. This is just another sample of what you can expect to see at the site. Some of the images are hard to see because of trees and brush that are in the way. Visiting in the winter months would reveal more of a few of the panels. If you do happen to visit in the summer months be sure to bring some bug spray because the mosquitoes can be absolutely fierce. We barely touched on all of the different images that you can expect to see if you visit. 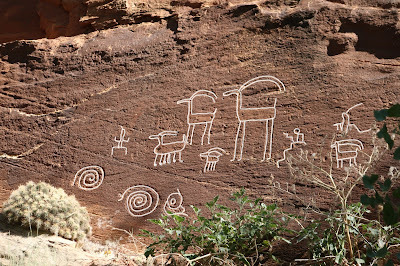 It is our opinion that the Upper Sand Island Petroglyphs is a must see site for those interested in rock art. If you would like to see it for yourself then all you have to do is 'Take a hike'.